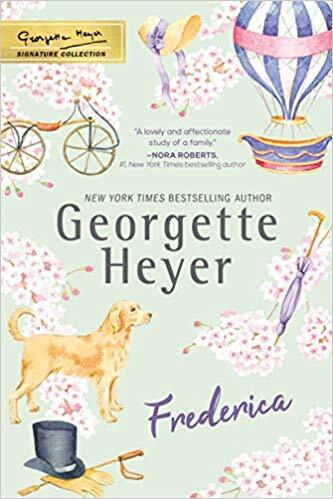 Orignally published in 1965, Georgette Heyer's novel Frederica is once again available, this time as part of Sourcebooks' charmingly packaged “Georgette Heyer Signature Collection”. Frederica falls just a hair short of Heyer's best work, but pretty much any other historical romance novelist would consider this their masterpiece. When Frederica Merrivale arrives in London in 1818, she has one object in mind: finding the perfect husband for her beautiful, sweet-tempered younger sister Charis. She seeks out her distant cousin, the Marquis of Alverstoke, hoping that he might introduce her sister to London high society. Alverstoke has very little interest in helping Charis (or anyone else), but he is unexpectedly amused by Frederica's sunny confidence. The two form an unlikely friendship, and Alverstoke is surprised to find himself taking an ever-growing interest in the Merrivale family's affairs. Frederica isn't as dazzlingly charming as The Grand Sophy or my beloved Cotillion, or as original as A Civil Contract, but it does an A+ job of playing to Heyer's strengths. There are loads of memorable secondary characters, a realistic setting rife with historical detail, and a slow-burn romance between two well-matched protagonists. (Oh, and there's an adorable dog, too, which never hurts.) If you've never read a Heyer novel, Frederica would be a wonderful and representative introduction to her work, and I highly encourage you to check it out.